Location: Fragments are viewable in the Museum of Roman Civilization in the EUR, and the National Museum of Rome - Crypta Balbi. The wall where it was originally mounted faces Via dei Fori Imperiali, between the Basilica of Maxentius and the entrance to the Roman Forum. 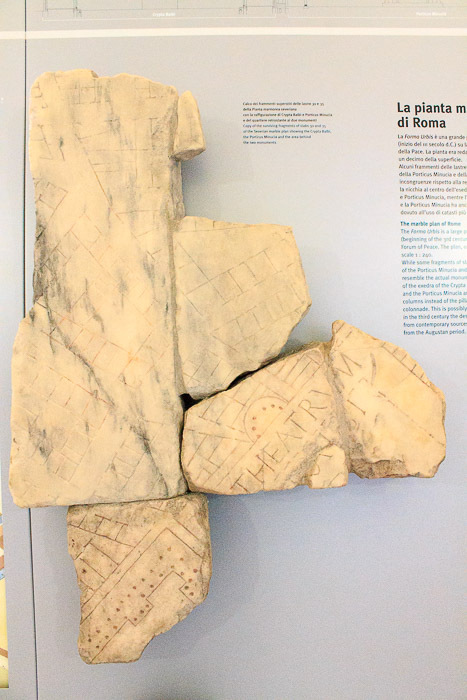 The Forma Urbis, sometimes called the Severan Marble Plan, was a marble map of early 3rd century Rome made by drawing on the marble slab that covered a wall inside of the Temple of Peace. It was created under the emperor Septimius Severus between 203 and 211 AD. It originally measured 60 feet wide by 43 feet high, and was carved into 150 marble slabs. The scale of the map was 1 to 240, and it was detailed enough to show the floor plans of nearly every temple, bath and apartment building in central Rome. As was most of the marble of Rome, it was gradually destroyed during the Middle Ages, with the marble stones being used as building materials. In 1562, fragments of the map were excavated from a site near the the church of Saints Cosmas and Damian (the church in the back of the Temple of Romulus). In all, about 10% of the original map has since been recovered, in the form of over 1000 fragments (some are shown in the 1st photo below), which are kept in the Palazzo dei Conservatori of the Capitoline Museum. 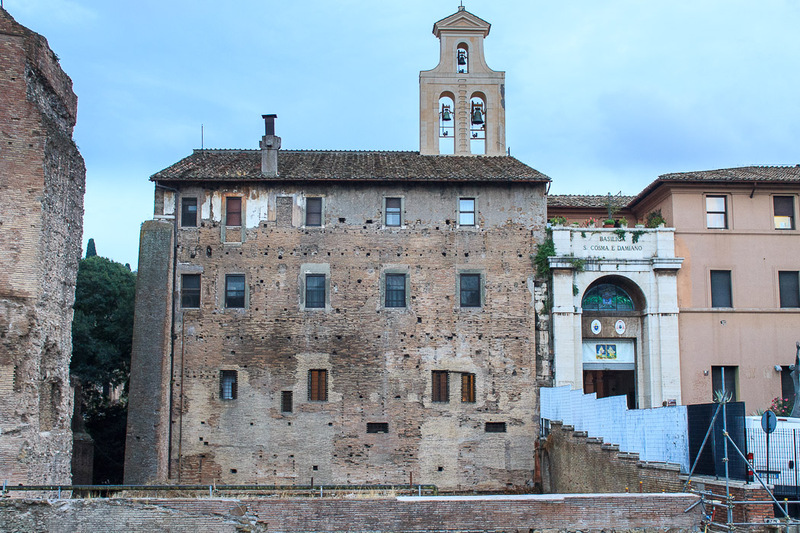 The wall where the Forma Urbis was originally mounted is now part of the facade of the church of Santa Cosma e Damiano, where the holes used to mount the slabs of the map can still be seen from Via dei Fori Imperiali (2nd photo below). You can see original fragments of the Forma Urbis in the National Museum of Rome - Crypta Balbi and the Museum of Roman Civilization. See all Forma Urbis photos.